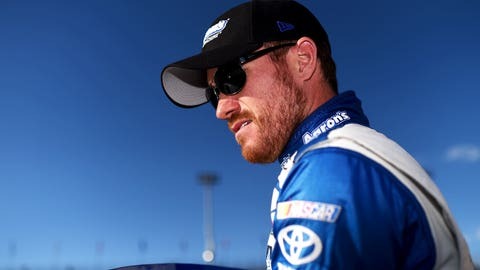 Brian Vickers is out indefinitely at Michael Waltrip Racing after experiencing another health setback. For the fourth time in his career, Brian Vickers has been sidelined by medical issues. Friday morning at Auto Club Speedway, Michael Waltrip Racing announced that Vickers has had a recurrence of blood clots and will be out of the car for the near future. Vickers’ seat in the No. 55 MWR Toyota will be filled this weekend by Brett Moffitt. The team had no timetable for Vickers’ return. In 2010, Vickers first developed blood clots while driving for the now defunct Red Bull Racing. He competed in only 11 races that year. Three years later, Vickers missed the final four races of the season with blood clots in his calf, and he missed the first two races of this year while he recovered from offseason heart surgery. On Jan. 21, doctors cleared Vickers to race again, with the stipulation that he must skip the season-opening Daytona 500 and the following weekend’s event at Atlanta Motor Speedway. Vickers will have to take blood-thinning medication to treat the clots and he will not be allowed to race while taking the blood thinners. 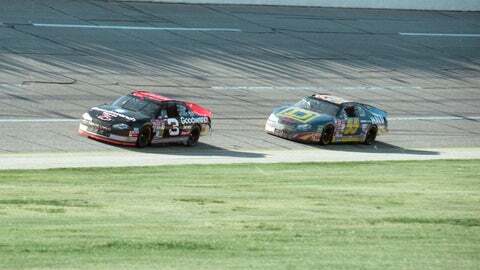 Vickers won the NASCAR XFINITY Series championship at the age of 20 in 2003, and has three victories and 12 poles in 318 career Sprint Cup starts. "First and foremost our thoughts are with Brian and his family," said MWR founder and co-owner Michael Waltrip, who will speak with the media later Friday at Auto Club Speedway. "He isn’t just our race car driver, he is our friend and we know the NASCAR community will continue to rally around Brian. We are fortunate to have Brett Moffitt in our system and marveled at his great drive in Atlanta three weeks ago, so we know he can get the job done in the No. 55 this weekend. As this news is very fresh and the situation is very fluid, we can only plan for this weekend at this point." In his only two NASCAR Sprint Cup Series races this year, Vickers finished 15th at Las Vegas and 41st at Phoenix. Moffitt finished eighth at Atlanta on March 1 driving the No. 55. He has also raced twice for Front Row Motorsports in 2015, filling in for David Ragan who has been tapped to sub for injured Kyle Busch in Joe Gibbs Racing’s No. 18 Toyota. Front Row announced Chris Buescher will replace Moffitt this weekend. "Thankfully, because I recognized the signs and symptoms, the doctors caught this early and I’m going to be OK," Vickers said. "I had finished my treatment for the clot I had in my leg back in 2013 and I haven’t needed to be on a blood thinner for a clot in my leg or lung since. Now I won’t be able to race because I’ll need to be back on a blood thinner. I’m going to follow doctor’s orders and do everything I need to do to get well. "Believe it or not, it’s Blood Clot Awareness Month and I was supposed to be at the track this weekend doing some work with my partners at Janssen focused on getting the word out. I’m disappointed I can’t be there but if there is a silver lining in all of this, hopefully what’s happened to me will help to raise awareness on this important health issue," Vickers said.